It has been a long time since the first Earth Day, but finally both the general public and businesses are stepping up to the plate to realize that we must take care of the only home that we have ever had. Global awareness on the topic of ‘going green’ has seen resurgence in the business world as they realize that it means better profit margins. While this is the major reason for a business to make the transition to a green outlook, it isn’t the only reason. 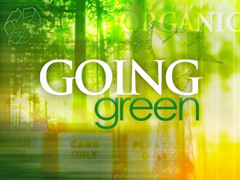 The term ‘going green’ can mean a lot of things to a lot of people. Overall, the general description translates to making changes to incorporate every aspect of business and life to have little or no impact on the ecology as well as contribute to sustainable energy policies. Quite a topic and a large undertaking when you are talking about the business world. You see, they simply don’t adopt change easily. Transitioning does take time and many businesses are seeing small savings to start out with as they make internal changes to more energy efficient systems. This can include everything from the energy savings light bulb to encouraging email instead of standard paper mailing. Email alone has been shown to save around $2 million per year. As public awareness increases on the topic of a healthy ecology, so do their purchasing choices. The general public is now proving that they prefer to buy from companies that are making smart ecological choices and will especially support those companies that are taking these choices to the top levels of going green in a carbonNeutral effort. The carbonNeutral effort reduced the carbon footprint of a company so that it equates to zero, thereby not impacting the ecology. There is even a better investment of the public dollar when they find out a company has reversed the pollution process completely and are using sustainable energies to actually ‘give back’ to our ecology. More and more companies are producing their products with less fossil fuel based packaging and increasing their packaging using recyclable or earth friendly containers. The shipping industry has been slow to adopt any kind of replacement of the typical Styrofoam packing materials. In the 1980’s there was a plant based edible version, but the cost during that time didn’t allow the widespread use of the ‘edible peanuts’ (as they were known). The cosmetic and beauty aids industry has been particularly behind the times when it comes to earth-friendly packaging. Many of the companies pack and repack in layers of plastic, which is fossil-fuel based. Boxes and containers are not made of any recycled materials and yet the prices for these products continue to skyrocket. Manufacturing facilities in these areas have also been slow at adding any earth-friendly or sustainable energy practices. It is becoming quite common for businesses to tout the use of recycled materials for all kinds of things: building and construction, recycled boxes and containers, and packaging and shipping. We are starting to see more companies add earth-friendly practices, products and attitudes. It seems going green is good for both the business and the planet. Posted on April 6th under Global Ecology.